The Ordinary Life of an Extraordinary Girl: The last game! Last night was the final C team basketball game of the 2009 - 2010 season. Sarah, Charlie and our WindWalkers friends all came to watch. I prayed Alex would play, and not feel she had disappointed her friends. The score was close until the middle of the 4th quarter. Based on experience, I knew this meant Alex might not play. I sat in my seat hoping our team would make a bunch of baskets. Truth be told, I secretly hoped the other team might make a bunch of baskets. In either case, this would put Alex in the game. This philosophy of only playing Alex in blowout games is contrary to my sense of fair play. I believe a C team; a team made up of freshmen, should be a training team. A place not only to teach the girls to play basketball, but also a place where the girls learn about good sportsmanship and being part of a team. I suggest this was only partially accomplished this season. No need to be more specific. Thankfully the Lady Longhorns scored a number of baskets in the fourth quarter, and were ahead by ten points with four minutes left to play. To the delight of her fans, which included everyone in the gym, Alex went in the game. 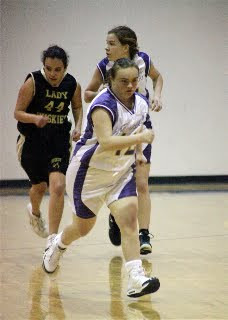 She hustled and gave it her all, for those last four minutes. The crowd cheered and the chant of ‘Go Alex” filled the room. Alex was high fived when the game finished by everyone on the opposing team. She was also complimented by their Coach; “Nice game, Alex”. We went home with a proud girl; one who was able to show her best friend Sarah she is just like the other kids. 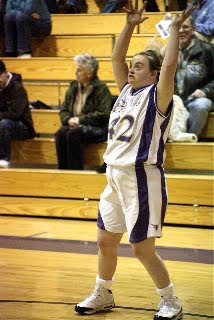 She plays basketball, gets cheered on and has friends. That should not be too much to ask.